The Uttar Pradesh Pollution Control Board (UPPCB) has directed the brick kiln owners of Ghaziabad, Gautam Budh Nagar and Hapur to upgrade their technology from natural draft brick kilns to induced draft brick kilns within 90 days. The UPPCB notice was issued last month under Section 31(A) of the Air (Prevention and Control of Pollution) Act, 1981. All the three districts fall under the National Capital Region (NCR). “The UPPCB received a directive from the Central Pollution Control Board (CPCB) to enforce strict compliance with (the) conversion of natural draft brick kilns to induced draft and we are just complying with the direction received,” a senior official of Greater Noida regional office of the UPPCB said. The CPCB directive was sent under section 18(1)(b) of the above mentioned Act for initiating action against various pollution sources to improve the air quality of Delhi and NCR. According to pollution experts, the UPPCB step is a welcome move as it has identified brick kilns as an important source of air pollution. However, the notification goes off the mark in terms of the technological solution it has proposed. The transition from natural draft kilns to induced draft ones is erroneous and shows total lack of technical understanding on the UPPCB’s part, experts said. In view of erratic power supply, kiln owners will have to run a diesel generator set to operate the fan if they shift to induced draft kilns which will further add to their woes. Also, the notification does not mention cleaner technologies that brick kilns need to adopt to reduce air pollution. There are different types of brick-making technologies available in India. These techniques vary in terms of arrangement of bricks, fuel feeding, air flow and the method of achieving relative movement between air flow and bricks. The commonly-found red bricks used for construction are made by firing dried bricks into kilns at temperatures up to around 1000 degrees Celsius. Air flow is important as it is responsible for the distribution of heat inside the kilns. In natural draft brick kilns, this is achieved by a chimney whereas in induced draft brick kilns, the air flow is controlled by a fan. Under the former technology, hot gases accumulating at the bottom of the chimney are lighter than the ambient air outside. The difference between the hot air inside and the relatively cooler air outside produces a pressure difference which is known as draft. In induced kilns as the movement of air is managed with the help of a fan, the pressure drop is higher than that found in the natural draft. It is believed that induced kilns operate faster, and thus reduce coal consumption. But to control the air flow and achieve proper brick firing, the brick setting in the kilns is denser than natural draft kilns. 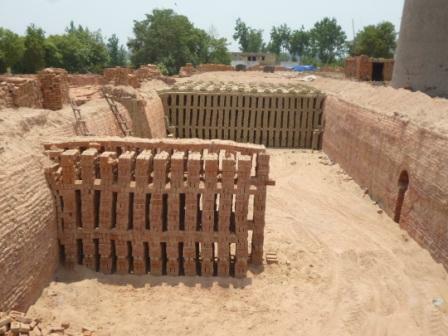 Most of the existing kilns in NCR are natural draft kilns that follow the Bull’s Trench Kiln technology. The table below shows us the results of monitoring air pollution (particularly suspended particulate matter or SPM in the air) and energy consumption of various kinds of kilns. The results show that the Natural Draft Bull’s Trench Kiln is the most polluting as well as the highest energy-consuming technology. It is only logical that this technology should not be allowed to operate as suggested in the UPPCB notification. The results also show that it is not only the method of creation of the draft (natural or induced) which determines the pollution level, but the kiln technology is also the determining factor. The lack of technical understanding and clarity on the part of the UPPCB is baffling the brick industry. Kushanga Mittal, a brick kiln owner near Greater Noida, has recently converted his kiln from fixed chimney Bull’s Trench Kiln to the natural draft zig-zag kiln. The performance of his kiln was recently monitored by an international research team and the SPM emissions were found to be low. “I have voluntarily invested more than Rs 20 lakh to upgrade my kiln and bring down emissions to low levels, but as my kiln is a natural draft kiln, it will not be considered as a cleaner one. This is unjust and unfair and the regulation needs to be amended,” he said. Experts said the UPPCB notification should be amended and the existing natural draft Bull’s Trench Kilns should be replaced with cleaner technologies. Several other developing countries have already undertaken similar measures. Vietnam has taken steps to ban traditional kilns and Bangladesh has banned Bull’s Trench Kilns. “There is adequate technical understanding and experience available today in the country which can be used to assist the brick kilns owners and the CPCB is making right technological choices that will help in reducing air pollution in the NCR region as well as modernise the brick industry. As brick kilns provide employment to millions of workers, a much more sensitive and holistic approach is required for achieving a sustainable transformation,” Sameer Maithel, director, Greentech Knowledge Solution Private Limited, a clean energy research firm, said. Half-baked measures lacking scientific validity and technological understanding should be avoided. If the CPCB and the UPPCB really want to bring a major difference in air quality, they will have to come up with a clear technological roadmap for the brick sector, experts said. 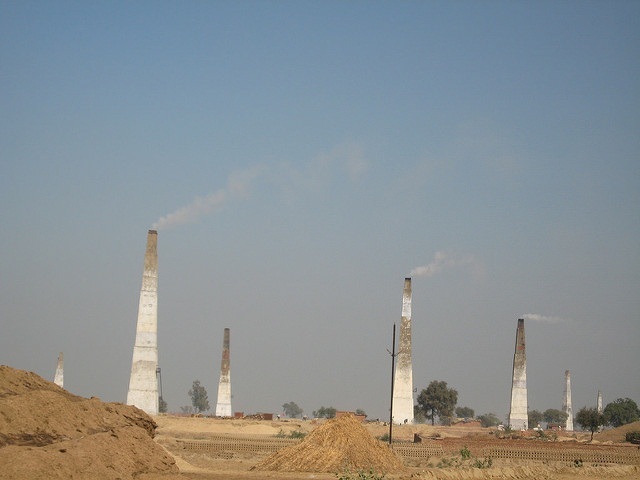 Can polluting brick kilns be cleaned up?